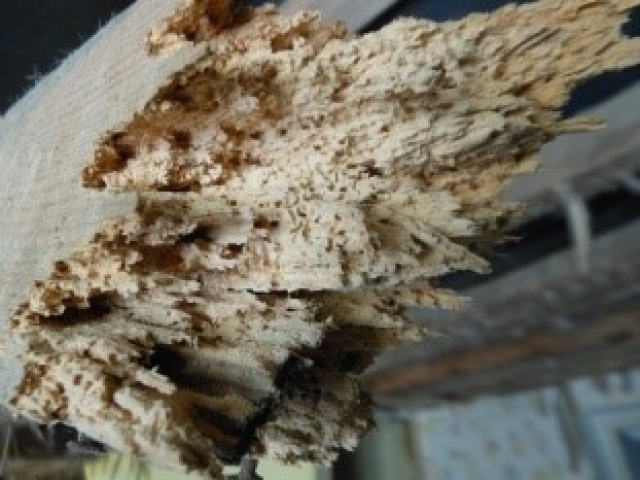 Woodworm is a generic term commonly given to all wood-boring beetles, but there are many species of beetles common to the United Kingdom and like fungal decay they can in the correct conditions, cause considerable damage resulting in significant weakening and damage to structural and joinery timbers. 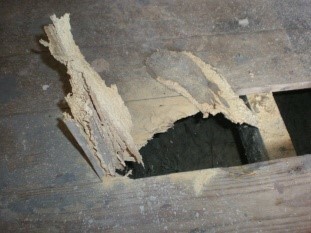 Activity by wood boring beetles is always normally confirmed by the presence of fresh bore dust (known as frass) on the timbers and a clean exit (flight) hole. 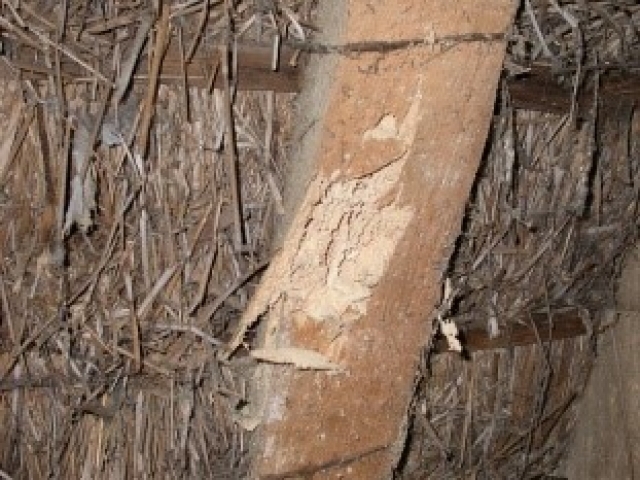 The extent of beetle infestation and the associated damage caused will always be dependent on the particular beetle and the type of timber being attacked. 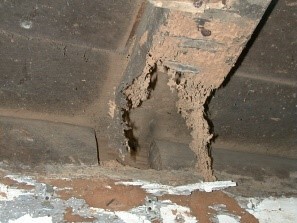 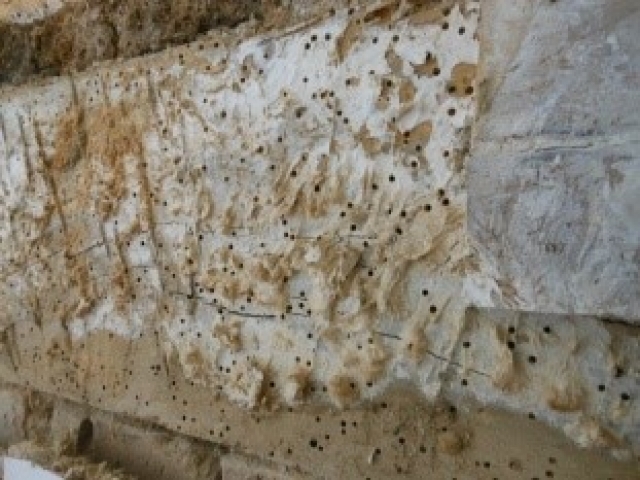 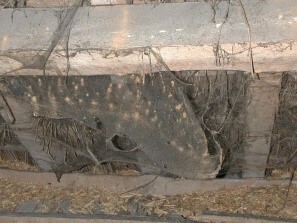 Some beetles such as the Death Watch Beetle and Weevil prefer damp and / or decaying timbers for their survival and in some cases chemical treatments are not always a requirement to eradicate the infestation, as controlling the moisture levels and drying the timbers may well be all that is required. 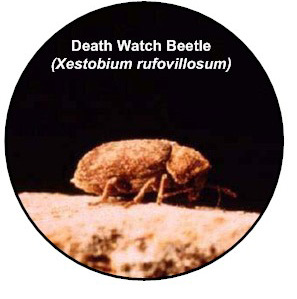 It is therefore extremely important that the correct identification of the beetle species is made as the wrong identification can lead to the un-necessary and expensive of chemical treatments. 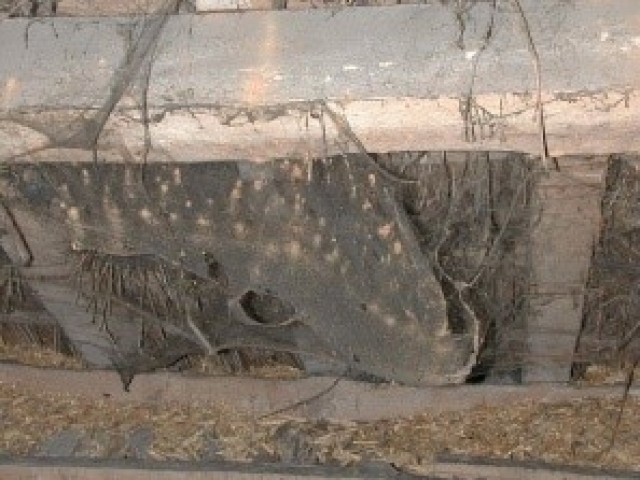 When wood boring beetle activity is diagnosed and chemical treatment is recommended, then it is essential that the treatments should always be targeted to the areas of concern and in some cases with particular beetles ongoing monitoring may need to be considered. 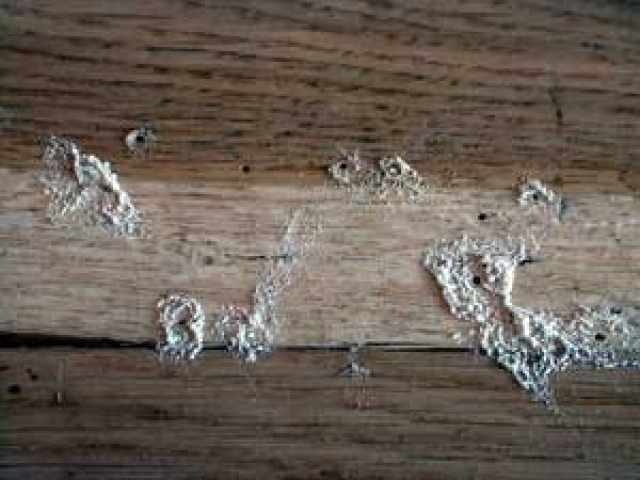 Common Furniture Beetle: Commonly referred to as woodworm. 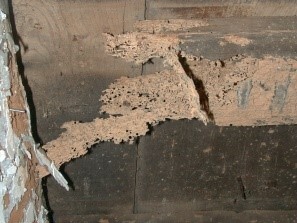 It is the most common wood boring insect found in buildings throughout Britain. 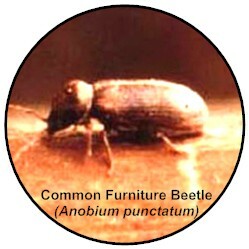 This beetle will attack softwoods and European hardwoods and is often found in old furniture from where it gets its name. Death Watch Beetle: Death-watch beetle is more common in the southern half of the United Kingdom than in the north and commonly infests Oak and Elm which were the traditional timbers used for constructing period and timber framed buildings churches etc. 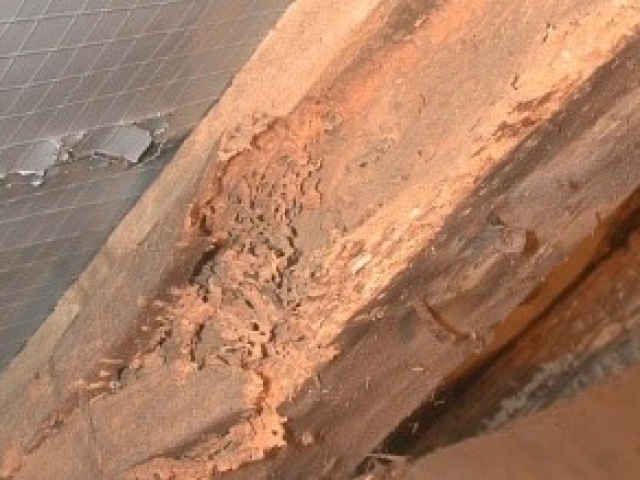 It is generally stated the death-watch beetle is only found where timbers have been subjected to moisture ingress and / or fungal decay, which are the conditions favouring the rapid development of this insect. 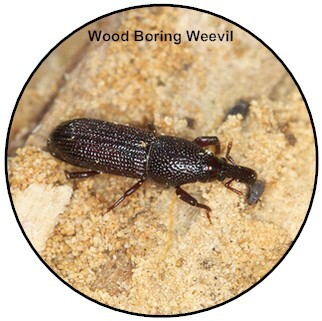 Wood Boring Weevil: Wood Boring Weevil is another insect that favours extreme damp conditions and decay. 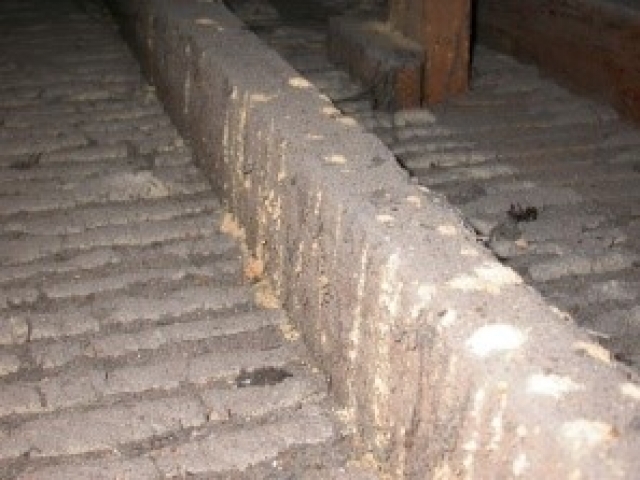 Chemical treatment is therefore not always a requirement as dry timbers will not be infested by Weevil. However, in well-established attacks structural damage is likely to have occurred in areas of poor ventilation such as basements, sub floors etc. 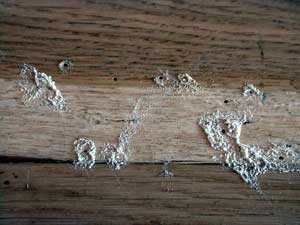 Skirting boards and other items of joinery in contact with moisture can also be affected. 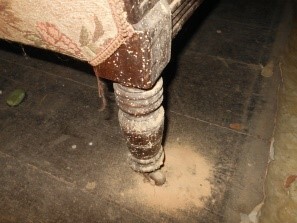 Powder Post Beetle: With the popularity in the UK of hardwood and laminate flooring in recent years this particular insect has become more common. 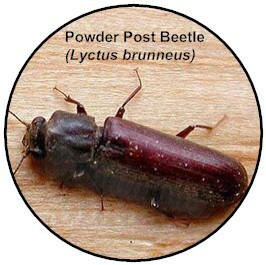 Powder Post Beetle commonly attacks the sapwood of tropical and European hardwoods, particularly Oak and Elm with large pores and starch content, not found in softwoods. 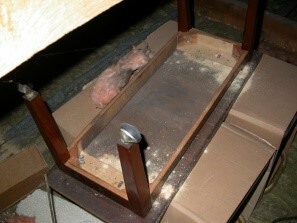 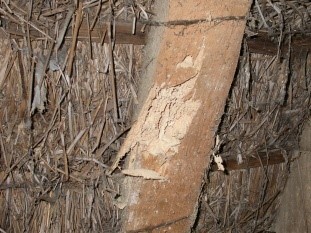 Damage almost certainly originates in storage and timber yards and is often misdiagnosed as Common Furniture Beetle.